We've been learning about Origami, and couldn't wait to try a few simple projects! The kids and I rushed out to our local craft store to buy an Origami Kit. This seemed to be more cost effective than buying all of the components separately. It was a bit confusing for us to figure out the Origami diagrams at first, so we turned to some help from YouTube to guide us through the steps. 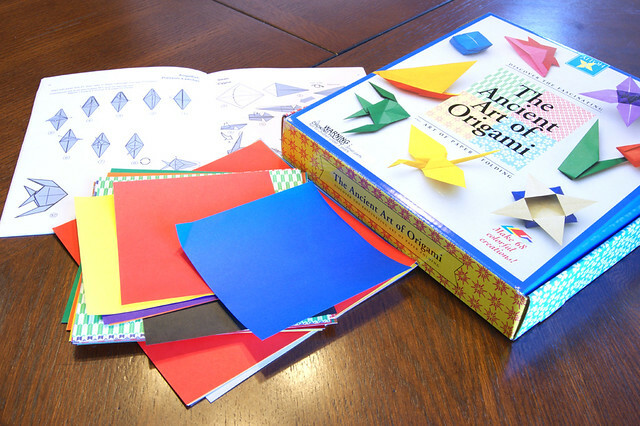 Now that we are familiar with how to make the proper folds, it will be nice to have our book handy for future Origami sessions. An ancient Japanese legend promises that anyone who folds a thousand origami cranes will be granted a wish by a crane. The crane is a revered creature in Japanese culture, and 1,000 Origami cranes, held together by string, are a symbol of world peace. 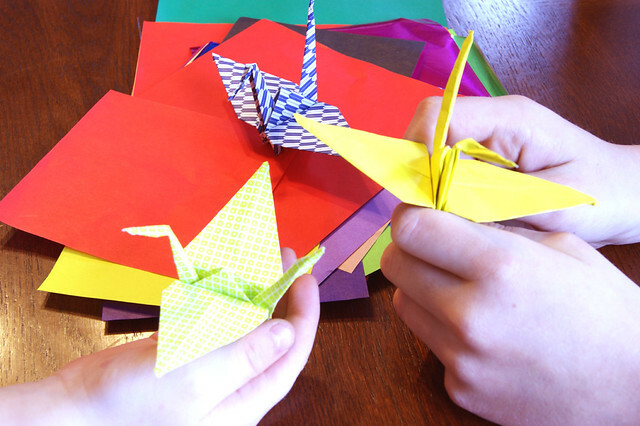 Individual Origami cranes are also often exchanged between special friends and loved ones. Folding an Origami crane is more difficult than the introductory cup and balloon. However, if you follow along with this video, it is an enjoyable challenge! We chose the medium-sized paper from our set (about 6" x 6") in three separate colors. We plan to fold more and hang them from our studio ceiling! My youngest son chose the Angelfish from our Origami book, so we gave it a whirl. It is more difficult than the crane, but again, we found a tutorial video, and it was quite fun! We each chose our own color of the medium-sized Origami paper for our fish. There are some small folds in this project with which little hands will require help. These are so sweet, and would look adorable on a card, gift wrapping, or with a magnet on the refrigerator. My youngest son attached a magnet to his fish, then tied a paperclip to a string and wrapped the other end around a popsicle stick. He made his own fishing game! 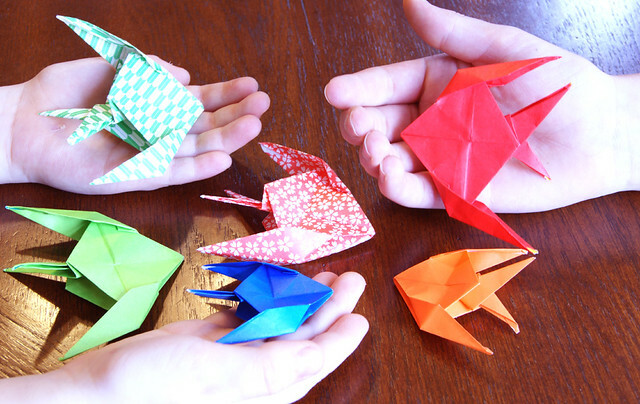 Origami is a practical and enjoyable craft for the whole family. You can create toys, decorations, and gifts simply with some beautiful paper and a little patience! What fun! Such a great activity to do with your children. I bought a book from Dover about doing origami with dollar bills. I learned a few simple ones and found I could entertain any squirming child almost anywhere. This is now a handy grandma skill! Can't wait to see where this leads! Origami is timeless, ageless and genderless. The angelfish are so cute! Cool paper in that kit, too!